Did you know there are 31(!) ingredients in the plain breadcrumbs sold at the grocery store? Really, have a look next time you’re shopping. There is no reason to ever buy breadcrumbs. Have you ever thrown away the heel of a loaf of bread because it’s too small to make a sandwich or because you just don’t like the heel? Or, have you forgotten you have some bread in the house, only to discover a week later that it has gone completely stale? Have you ever bought some really cheap, nasty, industrial, squishy bread because the only store open was the corner bodega and you were desperate, but now that you’ve eaten two slices you regret it? In all of these situations you might end up throwing the bread away, what else can you do? Make breadcrumbs! I will confess that the Panko or Japanese-style breadcrumbs sold in stores these days are very nice. They only have 5 ingredients, are perfectly uniform and super crunchy, and I feel like a celebrity chef when I use them. But when I think about how they came to be so perfect, I get visions of factories in my head. My big reasons for making my own breadcrumbs (besides the fact that I’m a geek) are to prevent food waste, cut down on the number of containers I have to send to the landfill and keep unnecessary and possibly unhealthy ingredients out of my food. It seems ridiculous to pay a company to pulverize bread and toast it in a factory somewhere and then ship it to a store so I can buy it when I can make the same thing in about half an hour at home. There are two types of breadcrumbs fresh (sometimes called moist), and dry. The dry ones are crunchy and are mainly used in recipes as a coating or topping. Fresh breadcrumbs are also made from stale bread but they are not toasted so they remain softer. 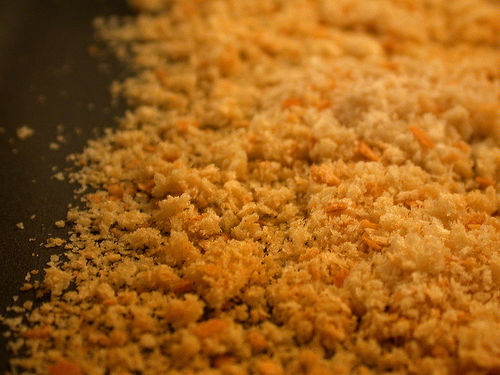 Fresh breadcrumbs are used for stuffing or as a filler to bulk out meat preparations and sauces. You may not get the same even browning from homemade dry crumbs as you do from the store bought kind, but I think that makes dishes look more homemade. The commercial crumbs often have some dried milk or egg in them, if you want to experiment you could try adding some powdered milk. I imagine the milk proteins would help the browning. Any kind of stale bread, dry but not rock hard, and certainly not moldy. If your bread isn’t stale, put the slices in a 350F oven for 5 minutes or so to dry it out, but don’t let it brown. Tear your bread into 1 inch pieces and process in a food processor or blender until you have the size breadcrumbs you wish. If you don’t have a food processor you can grate the bread on a box grater or put the dry bread in a bag and crush it with a rolling pin. These are fresh or moist bread crumbs. They can be stored in the freezer in a zip top bag until you need them. If you want to make dry bread crumbs preheat your oven to 350F and spread your fresh breadcrumbs in a single layer on a sheet pan. Bake them in the oven for 10 minutes. Then stir the crumbs to ensure even crisping and bake for an additional 5-10 minutes. You don’t want to brown the crumbs very much since you’ll likely be using them as a coating or topping where they will be cooked further. Just dry them out until they are crisp and crunchy. Store in a zip top bag in the freezer until needed. Variations: If you want to duplicate the “Italian style” breadcrumbs sold in stores, mix in some salt and dried herbs such as basil, and oregano.